The Dogo Argentino was developed in Argentina in the late 1920s by doctors Antonio and Agustin Nores Martinez, dog enthusiasts and avid hunters. The Dogo Argentino was primarily intended to be used as a hunting dog for puma and jaguar, as well as a guardian and all-around family dog. As a guard dog, the Dogo Argentino was expected not only to bark a warning at strangers and stop intruders, but to do so with such determination as to fight an intruder to the death, if needed, without being distracted by any injury inflicted to itself during the course of the battle. Dr. Martinez’ belief was that “A dog which attacks an intruder and then, at the first threat of injury, abandons its prisoner is worth nothing as a guardian.” And so great care was put into high pain tolerance for this breed. Another trait highly valued in the Dogo was his white fur, able to deflect the sun rather than absorb it. Unfortunately, Dogos still suffer from sunburn in intense heat. The base stock began with the Old Cordoba Fighting Dog (now extinct). This dog was known for one thing: fighting. It was said that an Old Cordoba would even try to pick a fight with the female it was trying to mate with. Next, several other breeds were added to the mix. These included Mastiffs, Bulldogs, Boxers, English Pointers, Bull Terriers, Old English Bulldogs, Mastiffs, Dogue De Bordeaux, Harlequin Great Danes, Pyrenean Mastiffs and Irish Wolfhounds. This created the animal that Martinez was looking for. The Dogo had the tenacity, endurance, confidence, trainability, guarding instinct, speed and awesome scenting ability that they had searched for. The first standard for this breed was recorded in 1928. The breed is still used today as a fighting and hunting dog in Argentina, and is popular in Europe, especially Germany. Here it gained recognition with the FCI in 1960. In America, there are clubs for this breed, although not widely known. Today they are used for narcotics and drug detection, police dogs, and even guides for the blind. 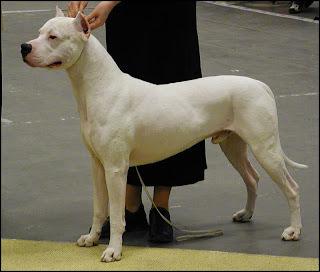 Dogo Argentinos are one of very few breeds to come from Argentina. A large dog measuring up to, but not more than 27 inches at the withers. Appropriate weight should be approximately 100 to 115 pounds. It is heavy-boned and incredibly muscular, with a large head, strong neck and deep, broad chest giving the appearance of incredible strength. The Dogo’s coat is short, thick and white in color, giving a striking appearance and allowing for the dog to function well in hot and cold climates. Maturity is slow reaching full size between 2 and 3 years of age. It’s gait is agile and firm, responding with quick reflexes. At full gait, the dogo displays all of it’s powerful energy. The Dogo Argentino is not hyperactive, but young pups are inquisitive and keep themselves busy by investigating everything. They are excellent for game hunting, friendly towards people, especially children. Very good guardians, faithful and docile, they make excellent guide dogs for the blind. They are reliable, protective, and friendly to friends and family. They are affectionate and love to be the center of attention. Dogos greatly enjoy human companionship, longing to be with their owners every step of the way. They are intelligent, curious, trainable and trustworthy. They are powerful, loyal and courageous. They are wary of strangers, and prospective owners should be aware that they were originally bred to be able to attack unwelcome guests, although they have been bred down to be pack hunters and non-aggressive. Some strains in Argentina are still bred for aggressiveness, so they can be used in dog fights. These lines are unsuitable for hunting or for families. These specific lines are smaller in size, ranging from 75 – 90 lbs. 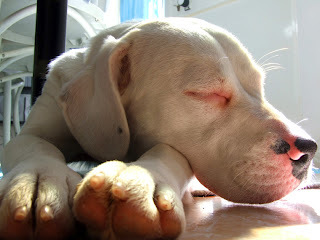 Regular Dogo Argentinos are protective of their space, and loyal to their owners. Dogos are an endless playmate, with stamina and long life. Dogos require a dominant owner to lead them. With Children: Dogo Argentinos love children with a passion; they are generally very good with them. They should be socialized early on. With Pets: The Dogo Argentino should be socialized and trained with other animals and dogs at an early age to eliminate aggression towards them. While the short coat is quite easy to maintain, please note that the skin of this breed is quite sensitive to the sun. Be sure to provide shade for the dog if it will be outside for a long time. It is said that this dog does not have a “doggy odor.” To keep the coat in top condition, weekly grooming is suggested. Be sure to use shampoos specially made for sensitive skin or white coats when bathing. The nails of this breed tend to grow quickly, so be sure to trim on a regular basis. The Argentine Dogo is considered to be an average shedder. This breed is also known to drool. While this breed will do fine in an apartment dwelling if plenty of exercise is provided, a large yard with room to run and plenty of shade is highly recommended. It is important to keep the dog inside when the temperature outside is below freezing. This breed also loves to spend time indoors with its family. It will enjoy a long daily walk as part of its exercise regimen. The dogo invented grooming with a brush. A rubber brush rubbed over the dogo’s body will keep the coat in good condition and serve to remove any loose hairs. It may well induce purring. Brush the teeth, trim the toenails and clean the ears. Add the occasional bath, and you have a happy dog. A white-coated dog is more susceptible to sunburn, and you may carefully apply sunscreen to the areas around the nose. It is important that any dog have access to plenty of fresh water at all times, especially during hot weather, and your dogo must never be left outside or exposed to extremes in temperature. Regular exercise will keep your dogo in good condition, and will preserve the beautiful muscle tone that is predominant in this breed. Howling Acres will always be available to any owner for consultation and will be pleased to answer any questions the owners may have concerning their charge.